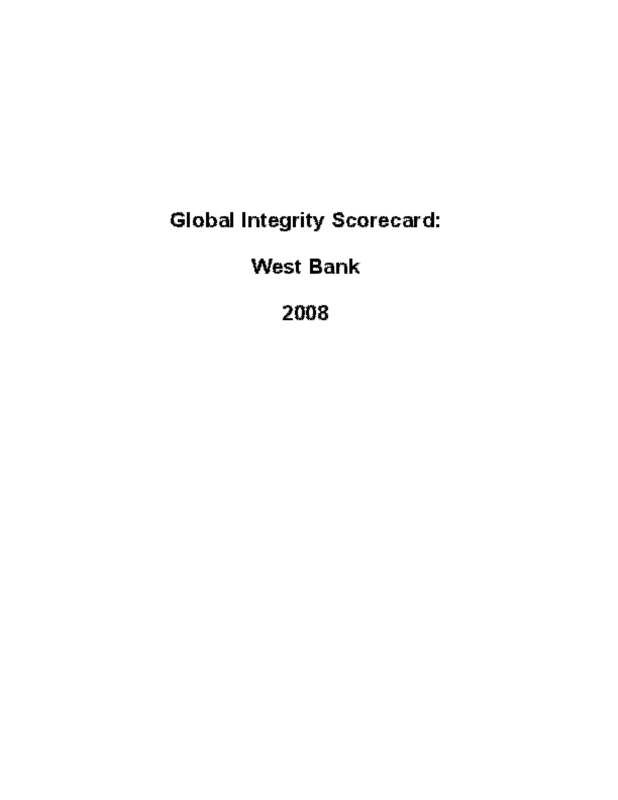 Highlights: The West Bank faces serious problems with its governance and anti-corruption framework, not surprising given the territory's conflict-riddled history. Civil society, government accountability, administration and civil service, and the rule of law are all rated as very weak. Other bad news includes an ineffective audit institution, weak regulations on political financing, and a lack of institutional mechanisms through which citizens can gain access to public information. Nevertheless, there is some good news. There is a relatively strong ombudsman office, voting and election monitoring are generally inclusive and secure, and the justice system is accessible and fair to most citizens. Integrity Indicators Scorecard: Scores, scoring criteria, commentary, references, and peer review perspectives for more than 300 Integrity Indicators. Reporter's Notebook: An on-the-ground look at corruption and integrity from a leading local journalist. Corruption Timeline: Ten years of political context to today's corruption and integrity issues. Country Facts: Statistical context for each country.